I have had the great honor of working with so many of you on so many projects and opportunities during my time serving Prairie Village. Several of these individuals have offered to share a little of their perspective on our working together. 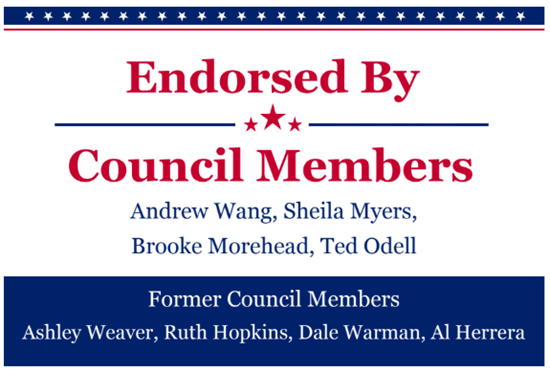 I thank them for their endorsement and invite you to explore their responses. I want to talk about the character and unwavering friendship of Serena Schermoly. There is a lot to tell and there’s no way to express the love she’s shown me over the years. I’m not only her ex-husband and the father of her two youngest children, but I’m also a very grateful recovering drug addict. Grateful to the Lord for giving me the strength to choose a different way every day for the last 5 years and grateful to Him for putting Serena in my life. If she wasn’t in my life, there’s no doubt in my mind I’d be dead. Drugs led me down a very dark and destructive path. They took me to depths I never thought possible. They turned a good, law abiding family man into someone I wasn’t proud of at all and hardly recognized. I alienated the people that cared about me the most, including my children, and at the end there was nothing left but the grave. Through my own actions I was arrested several times and was sentenced to 16 months in prison. Serena never left me through all this and was always there for me no matter what. It would’ve been the easy thing for her to turn her back, take our children and walk away. She believed in me when I didn’t believe in myself and she knew the value of our children having a present and sober father. She even made it possible for me to talk to my children twice a week during this time. She kept me connected to my children and that gave me hope in a seemingly hopeless situation. It doesn’t stop there. Upon my release from prison when no one else would help she opened her home to me, provided me a car, worked with the state to facilitate my parole and helped me to get a job in my field. I’ve worked every day since, and have excelled in my profession thanks to Serena. Later she facilitated a parole transfer for me to join the family here in Kansas, and to make a fresh start and be an involved and visible father to our children. You see, I would’ve been just another parolee in a halfway house somewhere, hopeless and missing my children. There’s no telling where my life might’ve gone. Even at my lowest she was there. Without her love and support I can’t say exactly where I’d be. Sometimes in life all someone needs is that one person to not walk away, not wash their hands, not give up. They need someone to stand in the gap, make the difference and not write you off as a lost cause. Serena has done that for me against her family’s and friend’s advice and her own husband’s wishes. Not because she had to but because she knew it was the right thing to do and the best thing for our children. She has set an example of the way we’re supposed to love each other. I know some terrible things are being said right now as she runs for public office, and I wanted people to know where her heart is. It’s with her family, friends and anyone else that needs help and encouragement. There’s more to people than what meets the eye. I wrote this letter in hopes that it would help people see Serena for the loving, caring and compassionate person she is or in hopes that it inspires someone to stand in the gap for someone suffering from addiction and to be the person that makes the difference like Serena did for me. We are strongly support Serena Schermoly in her effort to become Mayor of Prairie Village. Her impressive record in the business world, service on several Prairie Village committees, and great communication skills will serve her well when dealing with city projects and issues. We have found her to be enthusiastic, a good listener, a good neighbor, responding to questions promptly with an explanation and a willingness to work on the toughest projects to resolve an issue. 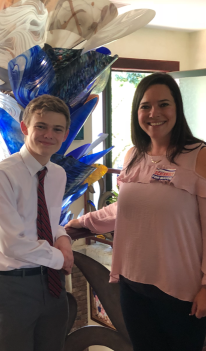 My candidate for Prairie Village Mayor, Serena Schermoly, will impress you with her sincerity, energy, and ability to articulate her plans for serving the people of Prairie Village. She listens to people’s concerns and finds solutions, directing dialogue that is genuinely productive. Last summer, as a fellow resident of Ward 2, I saw Serena carefully follow the reconstruction of the sidewalk and driveways on my street at 67th Street between Colonial and Lamar. She spoke to every resident about their personal concerns regarding the changes. Her personal touch and energy in following through are her leadership strengths. Her hope in this campaign is simply to achieve a greater level of public service to Prairie Village citizens. I would be extremely proud to see her as our mayor. I believe that her commonsense approach and vision are aligned with what the residents of PV want and are seeking. Throughout her term as Council Woman, I have seen her engage so many residents and thoughtfully listened to what matters to them. Serena has also increased the transparency of our local government by advocating and instituting live streaming of all council meetings so they are easily accessible to all residents. Serena Schermoly is a dedicated and selfless public servant who I am confident will continue to serve our community with our best interests in mind. I am confident she will represent us faithfully and ensure our voices are heard. Please go out and vote for Serena Schermoly for Mayor!! We’ll soon have the opportunity to choose a new mayor for our city. I’d like to tell you why I plan to vote for Serena Schermoly. Serena listened when our neighborhood asked to have the speed monitored on our street. Serena listened when we asked to have a crosswalk created to the after-school program at a church in our neighborhood. Serena listened when we had concerns about safety on our neighborhood streets. I can share as a resident in Serena’s neighborhood ward that she reflects the views of our neighbors when she votes. She regularly asks for input on citywide decisions, such as housing construction, parks, events, and retail areas. I’ve been pleasantly surprised how many times Serena has sent me an email asking for my thoughts on some of these decisions – and I know she regularly communicates this way with many residents. We have a great opportunity in our city to elect a new mayor who knows residents by name and who will make informed decisions on their behalf. I’m pleased to vote for Serena Schermoly! 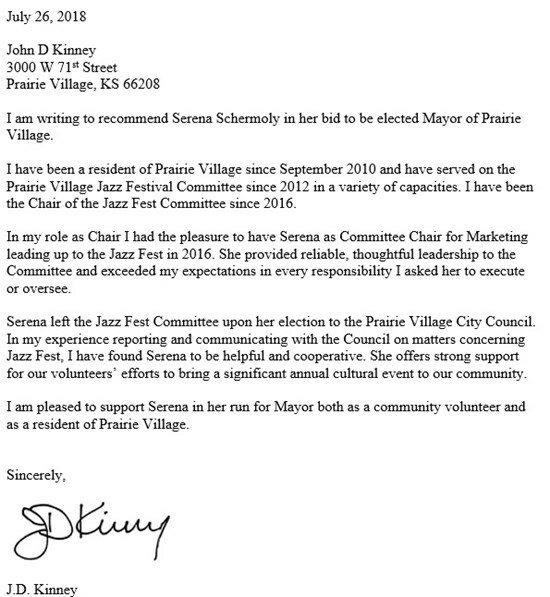 As a long time Prairie Village resident and one who has been actively involved on a volunteer basis in Prairie Village for over 20 years, first as a member of the Parks Board, then as the founding member of the Tree Board, and finally as a member of the Arts Council, I am pleased to recommend and endorse Serena Schermoly in her candidacy for Mayor of Prairie Village. Serena became invested in Prairie Village when she served on the Arts Council, where she took an active and inspirational role in the promotion of the arts in the city. Then, becoming an elected member of the City Council, Serena has been proactive in learning about the needs of the residents, the concerns of the staff regarding programs to support the infrastructure and quality of life in the city and envisioning ways that the city can improve services and opportunities to its residents. I am impressed with Serena’s overriding commitment to the residents of the city, not only by supporting the issues like keeping the charm of the city intact, but by looking at major issues from the point of view of how policies created for developers can have consequences for existing residents. Serena wants to create a community that has an identity by establishing volunteer opportunities that allow expanded participation for residents to become involved in city life. (She volunteered for a year on the Arts Council before there was a seat available for her appointment as a voting council member.) She wants to create opportunities for the community to come together to help older residents to maintain their homes so they can continue to live in Prairie Village. Also, as a small business owner, Serena is very sensitive to appropriate use of city funds. To that end she wants the city to find and apply for grants that can help with funding of city improvements. It is for the above reasons, and many others, that I have taken an active role in promoting Serena in her bid for Mayor of Prairie Village by volunteering to be the treasurer for her campaign. I can honestly say that I believe that Serena will make a clear difference in the lives of the residents of Prairie Village in the role of Mayor. Serena Schermoly is my choice for Prairie Village Mayor, and I encourage you to choose her, too. She is a longtime resident of this city we all love, and she has shown great commitment to our city and to us in her role as City Council Member for the last two years. Serena’s professional career is impressive, with more than 25 years in marketing and more than 15 years in the transportation industry. Her expertise spans communications, logistics, and safety and compliance. Serena also supports the arts, currently serving as Chairman of the Prairie Village Arts Council. She understands business and the value of arts and culture, and she is a devoted mother and loyal friend. I am confident Serena has the right combination of skills to move our city forward. She is service-minded, inquisitive, business-savvy, and compassionate. If you know her like I do, you know she isn’t afraid to be transparent and also speak up and ask questions. She will bring her honesty and integrity with her into the role of Mayor and will serve us well. Please join me in electing Serena Schermoly the next Mayor of Prairie Village. 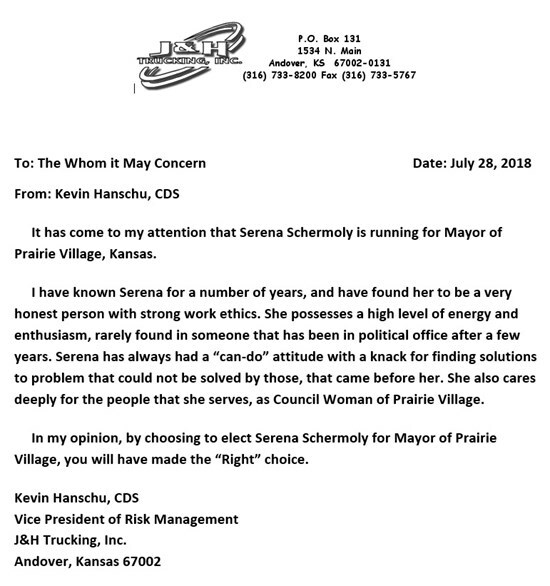 Serena Schermoly is beyond a doubt the logical voice I have heard in the cacophony of political jargon and rhetoric during the mayoral race here in Prairie Village. Her background has the excellent depth that lends to her natural progression into the mayor's office. From the fantastic work she had performed as the marketing director for the Prairie Village Jazz Fest, Teen Council to her current positions within the Arts Council, Serena has continually contributed to the Prairie Village “Charm.” Just as important is the work she has initiated and supported concerning the improvements to our pedestrian and leisurely commute throughout our city. Moreover the work she has done in the advancement of our bike path travels, all the while working to enhance statuaries and our neighborhood islands that make our village extraordinary. Serena has taken on a diligent role in assuring that our community is looking to maintain proper oversight of the new home construction in Prairie Village. While there is no doubt that new home builds are a significant contributor to our growth, a consistent template is necessary to ensure guidelines sustain the great charm of our village. Her voice has been steady on the issue of taxes and the monies in the city general fund. “The city must be disciplined to control cost, and not view the $900 thousand as a windfall that can be used to grow city government.” Serena understands that the windfall gain from our taxes must be utilized with the needs of the residents as the first consideration. Serena Schermoly has my recommendation for Mayor of Prairie Village. I believe with a strong presence like Serena, the present gaps we currently find in Prairie Village government will cease to exist. She is a leader that people just naturally follow because people and causes come first.